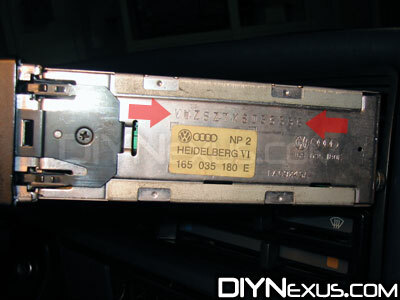 This DIY explains what you’ll need to do to obtain your factory radio code if it has been lost. Since you’ll need to get some serial numbers and codes off of the radio’s housing, this DIY assumes you’ve got the radio removed. If yours hasn’t been removed yet, and you are unsure how to do so, check out our Radio Removal guide. DISCLAIMER: No warranty or guarantee is provided for the information provided on this site; you use it at your own risk. Although contributors to DIYNexus have an impressive depth of knowledge, neither they, nor DIYNexus can be held liable for any technical inaccuracies, typographical errors or consequences from the use of this information. Depending on the project, it is possible to void your factory warranty, disable a safety feature, create a hazardous condition, be injured or killed. 🙁 If you are uncomfortable or inexperienced working with anything described on this site, please consider having the work done professionally. You’re going to have to call or visit the VW dealer for this one, so we need to prepare all the information they will need BEFORE talking to them. 1) Grab your radio and look it over until you find the serial number on the side similar to this picture. It’s either on a sticker, or stamped directly into the metal case. You’ll want to write this down, or actually have the radio with you when speaking with the dealer. 2) Is the radio original to your car? If so, write down your VIN number from the small metal tag attached to the front of your dash. The location of this plate is highlighted in the pic to the right. 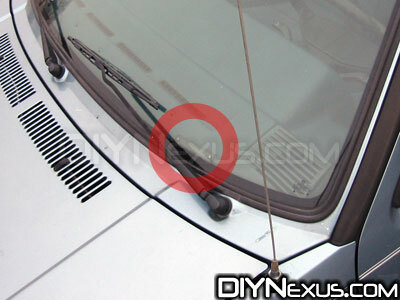 If the radio isn’t original to your car, do your best to get the VIN of the original car. If that’s not possible, try to get the VIN of a car that would have had that radio as factory equipment. 3) Call (or visit) the dealership. You’ll want to speak to the VW service department. I have a great local dealer who knows me personally and will just ask me for these two pieces of information and then, after verifying it in the computer, will give me the code. Your mileage may vary here. I’ve heard stories of dealers that require you to bring the car in for a “minimum service charge” so that they can verify your intent, and prove the radio isn’t stolen. If at first you don’t succeed, try calling another local dealer. Also, you may have better luck asking a used car lot that deals with Volkswagens to call for you. They have lost code issues all the time since they rarely get all the original paperwork with cars.